Europa Grain Free Wet is a specially formulated diet for adult dogs aged from 1 year onwards, Europa Grain Free Wet Food is made by using only the finest ingredients while avoiding ingredients known to cause allergies in dogs. 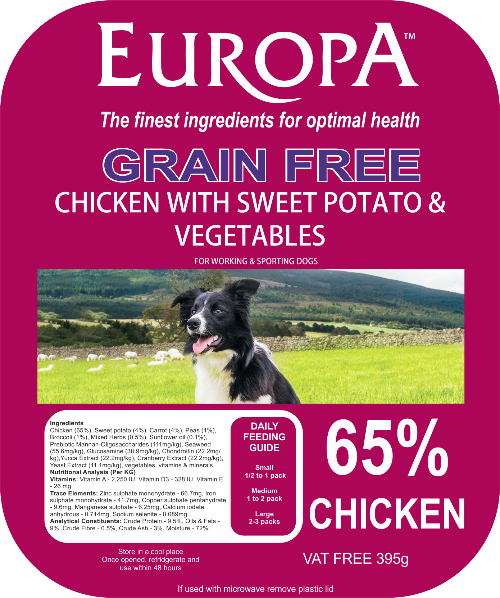 A combination on of 65% Chicken & 35% Fresh vegetables and botanicals makes this an excellent all round diet for your dog. Chicken (65%), Sweet potato (4%), Carrot (4%), Peas (1%), Broccoli (1%), Mixed Herbs (0.5%), Sunflower oil (0.1%), Prebiotic Mannan-Oligosaccharides (111mg/kg), Seaweed (55.6mg/kg), Glucosamine (38.9mg/kg), Chondroitin (22.2mg/kg),Yucca Extract (22.2mg/kg), Cranberry Extract (22.2mg/kg), Yeast Extract (11.1mg/kg), vegetables, vitamins & minerals. Crude Protein - 9.5%, Oils & Fats - 9%, Crude Fibre - 0.5%, Crude Ash - 3%, Moisture - 72%.